Joe has spent time in prison, drinks way too much and earns his living working for a lumber company that poisons trees to make room for more lucrative growth. It should come as no surprise that Joe lives in a rural southern backwater where trouble breeds like mosquitos and staying on the good side of life’s ledger requires effort. In Joe, Nicolas Cage finally finds a character with an internal conflict big enough to fill several of the actor’s recent junkyard movies, say Ghost Rider: Spirit of Vengeance, Trespass or Drive Angry. Like Cage, director David Gordon Green also appears to be reconnecting with his artistic past in this grit-laden adaptation of Father and Son, a 1991 novel by the late Larry Brown. Green began his career with the much-admired George Washington (2000) and other smaller movies, digressed with big-ticket comedies such as Pineapple Express (2008) and The Sitter (2011) and went indie again with last year’s Prince Avalance. It’s always dicey to separate a role from the movie its in, but I’d say that Cage scores higher than Green, which is another way of saying that the performance proves more memorable than a movie that can feel derivative and in which the squalid elements seem belabored. Cage’s every move embodies Joe’s conflict, which goes something like this: Joe tries to be decent, but keeps tripping over himself, mostly because of an anti-authoritarian streak that seems almost inbred. 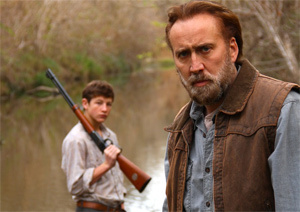 The story in Joe centers on the relationship between Cage’s Joe and Gary (Tye Sheridan), a teen-ager who idolizes the older man. Joe may be dissolute, but he prizes physical labor, and he appreciates young Gary’s desire to work his way out of his miserable surroundings, to earn his redemption with sweat. When Gary joins Joe’s tree-poisoning crew, he begins looking to Joe for the kind of guidance his own dad (the late Gary Poulter) can’t supply. Poulter’s Wade is irredeemable, a drunken degenerate so cruel he tries to pimp his own daughter to another of the town’s mean bastards (Ronnie Gene Blevins), a character with whom Joe finds himself at constant odds. Joe probably falls into the realm of raw-boned movies that, like their literary counterparts, might be dubbed “grit lit,” say last year’s Mud or 2010’s Winter’s Bone. Those two movies were significantly better than Joe, but Joe can be viewed as a sign of progress for Cage, who last gave a great performance in 2009’s little-seen Bad Lieutenant: Port of Call New Orleans. I hope the actor, who won an Oscar for 1996’s Leaving Las Vegas, plans to make room for more of these kinds of roles in the future, if only to balance his work in movies such as the National Treasure films, another of which apparently looms. Oh well, one always hopes.